Saint Stephen's church, according to an inscription marble plate embedded on the wall of its facade, was built in 1812 and honours the memory of St. Stephen. The temple is a three-aisled basilica with dimensions 41x19,5m. It was burnt from the ground up during the 1821 Revolution, as the entire village did. The residents scattered in the nearby vicinity and lower back later which will rebuild the village and the church, wherein they positioned a timber chancel and one of the few in the region wooden-carved ornate despotic throne. The unique chancel was a donation from the Konstamonitou monastery and covered 70 smaller timber pix and 14 silver-lined, large ones. On the night of September 5 of 2005, a great fire broke inside the temple and almost totally destroyed it. The roof collapsed, and everything inside the temple was burnt completely. The evidence of three older buildings was found during reconstruction and renovation of the building: a large three-aisled Christian basilica dated around 400, a small, one space byzantine temple of the 10th-11th century and a large rectangular post-byzantine structure without a niche of the 16th-17th century. At the same time, many findings, from the Christian era until the Ottoman rule period, saw the light of day (objects made of clay, marble, glass and metal, plasters and murals). Apart from these, fifteen tombs were discovered, some of which are dated in the Christian era, whereas others are dated in the 16th century B.C. Thus, an important part of the area’s history was discovered due to the reconstruction of the burnt building and thanks to the systematic excavations of the 10th Ephorate of Byzantine Antiquities. A historical part that shows the uninterrupted human presence and activity in Arnaia, and specifically where the temple of St. Stephen exists today. The archaeological site was configured in order to highlight the buried history of the place. 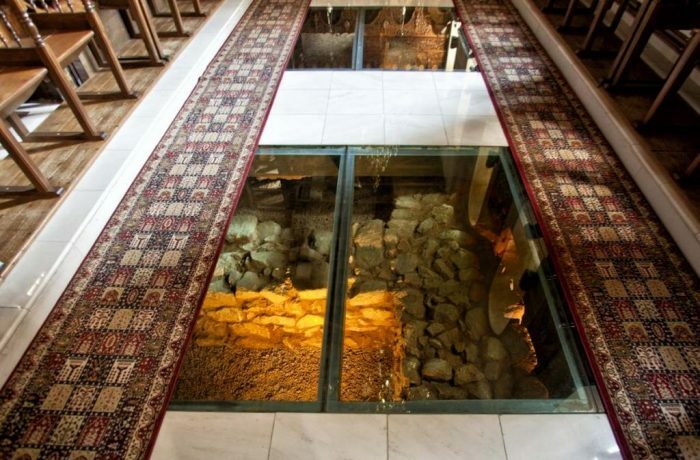 The floor of the renovated temple was made of transparent panels, over which the visitor can stand or walk while observing the enlightened archaeological site and the findings beneath it. The temple of St. Stephen of Arnaia is open for the public every day, from the morning until the afternoon.